Every single person loving Indian Cinema must have heard about the honor called Dadasaheb Phalke Award given by Government of India to a person for his contribution to cinema. But how many of them (particularly from the current generation) actually know about the real person after whose name this prestigious award is given, remains doubtful. 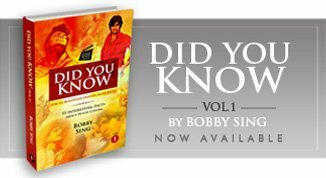 But if one truly considers himself a sincere Bollywood fan then he essentially needs to know about the visionary man, who actually started it all here in INDIA. 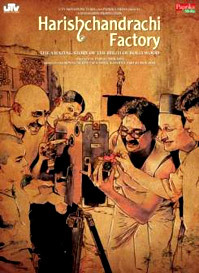 And in case you are not interested in reading or researching about him utilizing your own time and hard work then here is Harishchandrachi Factory, a well thought of biographical film to tell you all about those initial years of Indian Cinema when its first child (its first movie) got conceived by the one and only Dadasaheb Phalke in the year 1913. So from that angle alone, this Marathi Classic is a must watch for every Indian movie freak living anywhere around the globe. But don’t dare take it as just another slow, uninteresting and preachy biographical movie depicting the life of a legend, because that’s where HF breaks all previous norms of making a bio-pic in a very novel manner. Harishchandrachi Factory takes you almost 100 years back in the year 1912, when Dada Saheb Phalke gets impressed after watching a silent film “The Life of Christ” and decides to venture into silent-moving pictures after giving up his printing business. He chooses the story of “Raja Harishchandra” for making the first ever Indian Film which is later shown publicly in May 1913. Now this fine attempt by writer-director Paresh Mokashi presents an entertaining account of all those obstacles Dada Saheb faces in realizing his dream which are informative, enlightening as well as engaging at the same time. Like the initial phobia of camera in the people when it was believed that it could “steal a person’s soul”, the time when men used to perform as women but still hesitated to shave off their mustaches and those tough days when Dada Saheb lost his eye-sight in the process of realizing his first milestone of Indian Cinema. But amazingly the film never becomes too emotional or slow and maintains a very soothing comic tinge throughout its well edited length. No sequences stay for long and the script keeps moving at a great pace keeping you well engaged. Performances equally support its superb narration style with Nandhu Madhav brilliantly portraying Dada Saheb’s important journey. However the most deserving candidate remains its writer-director Paresh Mokashi for choosing this rare subject for his debut project which should be referred as a must see in every Film Institute operating in the county. Coming to the strange title of the film with the word ‘Factory’. That’s because at that time there was no such business called film business and when the people working with Dada Saheb asked him that What should they say to their neighbors that where are they working? Then to this the visionary tells them to say that they all are working in a ‘Factory’, which will impress everyone as the word relates with the foreigners. And that’s how Paresh calls it Harishchandrachi Factory. In nutshell, it’s a simple yet an important and impactful film which very realistically reveals the actual process of how Film-making started in India. It’s also a perfect tribute to the Late Dadasaheb Phalke who once refused the big offer of Englishmen in order to see the film-business flourishing in his own country. And that makes us all hugely proud today after almost 100 years of our own Indian Cinema. Hence if you are an Indian movie freak or love Indian Cinema for its unique characteristics then do watch Harishchandrachi Factory as your next step towards honoring the medium as that’s what needs to be done to salute our pioneer maestro DADA SAHEB PHALKE. Starring : Nandu Madhav, Vibhawari Deshpande and Atharva Karve. Tags : Harishchandrachi Factory (2010), Movies To See Before You Die Biographical, Must See Movies List at bobbytalkscinema.com, Not To Be Missed Movies, Must See Indian Films, OSCAR Nominee, 100 years of Indian Cinema, Celebrating 100 years of Cinema in India, Marathi Classics from India.